Freudenthal Manufacturing CS-60 Comfort Stall is the heaviest in the industry. The main frame is constructed of high tensile 2 3/8 - 10 gauge tubing, supported by a 2 3/8 curb post reinforced with a 3" x 18" long (5 gauge) steel rust guard with 12" poly-vinyl rust shield. 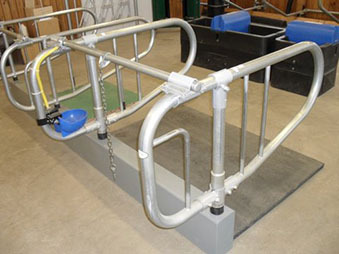 Included with the CS-60 is 48" of neck rail pipe, stall chain with push in snap, stall chain hanger clamp and a 6 1/2 lb top rail clamp. 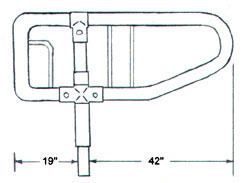 Stall frame clamps to post for easy installation. 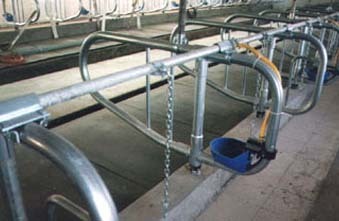 Durability and cow comfort was the main focus in the design of this stall. Satisfaction is guaranteed.